Rub Wine Wipes over your teeth and mouth, and order another round of red- the formula won't interfere with the taste of your wine! No more wine-stained teeth. Rub Wine Wipes over your teeth and mouth, and order another round of red- the formula won't interfere with the taste of your wine! 3 Wine Wipes, each set come in a purple velvet carrying case. 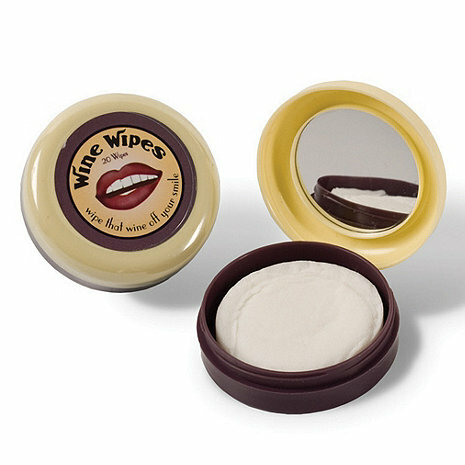 Each compact of Wine Wipes comes with 20 orange blossom flavored wipes and a mirror inside the lid for discreet, anywhere usage. Each one good for one use only. 60 total wine wipes. Contains: baking soda, hydrogen peroxide, calcium, glycerin, and orange blossom. These work great! I get a terrible red wine stain on my lips and teeth and it removed it instantly! After using them, I got them as a gift for my mother-in-law and she loved them.